Admiral is an American appliance brand that is currently manufactured by Whirlpool Corporation and sold exclusively at The Home Depot. 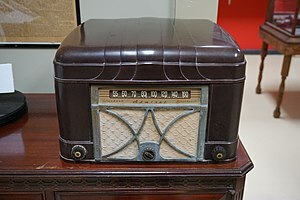 Ross Siragusa founded Continental Radio and Television Corp. as a maker of consumer electronics (radios and phonographs) in Chicago during 1934. This later became Admiral Corp. Its annual sales were about $2 million. Admiral supplied the U.S. military with electronic equipment during World War II, and was one of the major television manufacturers in the early era of that medium. In 1950, for instance, Admiral was selling a line of seven TV sets, with four models having a 12.5 in (32 cm) tube size (between $179.95 and $379.95, equivalent to $1,874 to $4,165 today), a 16 in (41 cm) model at $299.95 ($3,124), and two 19 in (48 cm) models (at $495 and $695, equivalent to $5,155 and $7,237). Success in television sales enabled the company to branch out into major appliances such as refrigerators by the 1950s. During World War II, Admiral was the weekly sponsor of the CBS Radio Network Sunday news program, World News Today, and Admiral used the promotional slogan "America's Smart Set." Admiral was also one of the first major advertisers on television, sponsoring Sid Caesar’s Your Show of Shows, Lights Out, Fulton J. Sheen's Life Is Worth Living, Admiral Presents the Five Star Review - Welcome Aboard, and Notre Dame football games. Annual sales approached $300 million and the company employed 8,500 people by the early 1960s. During the Cold War, Admiral manufactured military TV cameras for reconnaissance purposes under adverse conditions on land, in the air and under water. In 1962, Admiral Corporation listed four manufacturing plants in Illinois. These were identified as subsidiaries of Admiral International Corp. of which Norman E. Johnson was named president. The Chicago headquarters was located at 3800 West Cortland street and identified Ross D. Siragusa as Chairman and President, Cy S. Rossate Vice President in charge of production and William L. Dunn Vice President of engineering and stated a work force of 2,100 employees. This factory listed as its product line; television sets & combinations, radios, record changers, refrigerators, ranges, freezers, air conditioners, dehumidifiers and stereophonic phonographs. A second Chicago facility was located at 4150 North Knox avenue that had a work force of 230 employees that made record changers, power supplies and metal stampings. At Galesburg, Illinois the Midwest Manufacturing Corporation was listed as a subsidiary of Admiral Corp. with George Heidenblut as Vice President of engineering and a labor force of 1,400 employees that made refrigerators, freezers, air conditioners, dehumidifiers and ranges. The Harvard, Illinois plant located on South Division street listed Ernest Polichio as plant manager and its 2,000 employees made television sets. The Admiral work force in Illinois totaled 5,730 employees in 1962. The various divisions were sold to other companies by the mid-1970s, due in part to imported consumer electronics dumped on the US market from Japan. Rockwell International acquired the company in 1973, selling the appliance operations to Magic Chef, which was later sold to Maytag. In turn, Maytag was later acquired by Whirlpool. The Milwaukee Admirals hockey team derives its name from Admiral appliances. In 1971, when the team was sold by its original owner to a group of investors, one of the investors, Edwin J. Merar, owned an appliance store. The team was renamed the "Admirals" after the Admiral refrigerators sold in his store. In 1991, Maytag contracted with Montgomery Ward & Co. for the exclusive use of the Admiral brand on its consumer electronic goods. Montgomery Ward later went bankrupt and closed all its stores. After Maytag's sale to Whirlpool, the brand became exclusive to The Home Depot. During the 1990s, the Admiral brand name was being used on Zenith products. The television business continues with AOC International. AOC (originally Admiral Overseas Corporation) is an international brand of LCD and HDTV display devices. ^ McMahon, Morgan E. A Flick of the Switch 1930–1950 (Antiques Electronics Supply, 1990), p.51. ^ Admiral develops military TV CAMERA with mid-day vision in deep twilight. // Aviation Week, June 3, 1957, v. 66, no. 22, p. 192. ^ Illinois Manufacturers Directory, 1962, Manufacturers' News, Inc., p. 713-714, 1466, 1486.